It’s late afternoon, twenty minutes before the official start of the guided poster presentations. More or less a hundred posters hang around the big hall waiting for their accurate observation. Several stands with plenty and deep information enrich my view as I slowly walk up and down the rows. My mission is to analyze those discussing crop biotic stresses. 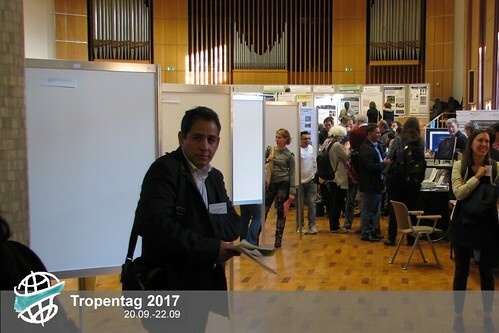 While concentrating on reading the introductions and results of the scientific papers, the AULA gradually fills with people. Students, doctoral candidates, young professionals, professors, people with and without suits, all dedicated individuals trying to understand the core of life: nature. As such, we want to know how nature behaves. We want to mimic it, and often we want to be in control of it. We sometimes fight it, and sometimes cooperate with it. We experiment with biological agents such as fungal isolates to fight root-knot nematodes on pineapple plantations in Kenya to avoid unnecessary pesticide use. Or we compare a conventional single-culture cacao cropping system with a agroforestry system, a natural, resilient system that copes with rapid changing abiotic factors due to climate change. Of course, we don't want to deal with the origins of the problem, which are usually man-made. What about reducing waste? Rethinking nutrition? Learning to make do with less? Ultimately, we all strive for the same: living our dreams. Answering the Big Questions on Global Agriculture and Nutrition. Science networking: a necessary challenge. Why do women prefer mango? Africa indigenous vegetables face extinction!